Fort Erie, Ontario, Canada is Keith's home town. 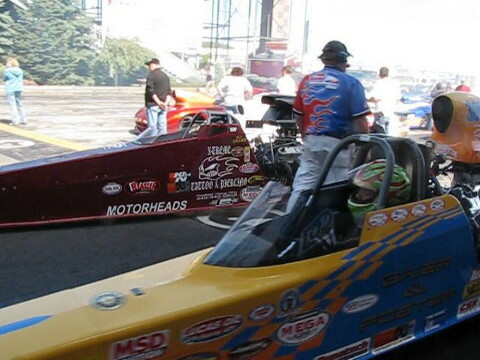 Keith was born with a car in his hand and while growing up he quickly learned about drag racing. By the time he completed elementary school some of his racing idols were Don Garlits and Jim Head. Keith owned his first car, a red cougar, when he was just 14 years old and he continued to own and drive cars from that time on. 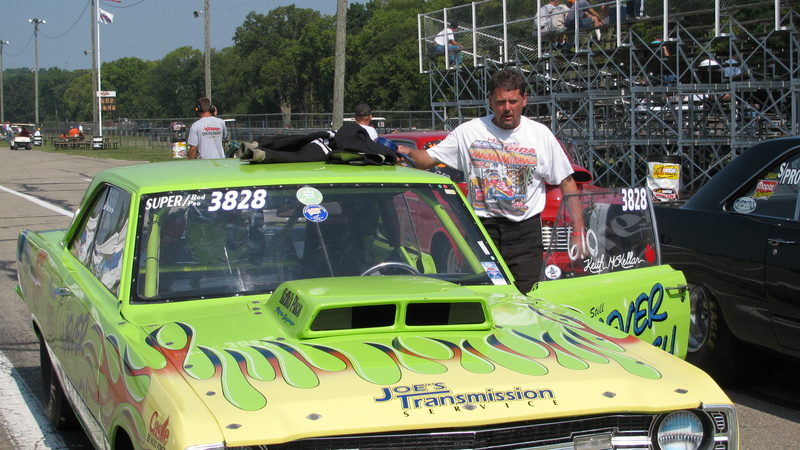 His love for the car, the race and the challenge continues to this day and on any given spring, summer or fall weekend or weekday he can be found at one of many drag racing parks. Keith has raced at Lancaster Speedway, New York International Raceway in New York State, Alexandria, Pittsburg Raceway, PA; Grand Bend Motorplex, St. Thomas Raceway and Toronto Mortorsports Park in Ontario; as far south as Bowling Green Kentucky, Lucas Oil Raceway, Indianapolis, Indiana, Gateway Motorsports Park, St. Louis Missouri, Xenia, Columbus, Thompson and Norwalk Ohio; west to Battle Creek, Michigan and as far west as Las Vegas Motor Speedway, USA; far east as New Brunswick and Prince Edward Island, Canada. Since a young boy he could be found fixing a car or anything else that had a motor. On any given day if he is not racing he can be found leaning over or working under a vehicle. His career turned to painting cars in a body shop and Service Advisors at various Goodyear and new and used automotive dealerships. He then worked for awhile in appliance repairs at Rosehill Auction House but his love for fixing cars continually came to the forefront. At various times he could be found with friend and fellow driver/mechanic Joe Bonifero of JOE'S Transmission, in a nearby Port Colborne High School speaking about careers involving motor sports and encouraging young students to follow their love of cars but always to drive in a controlled setting such as the track. One only needs to ask and if McKellar can, he will help. Recently Keith earned his basic level in welding and is eager to put his skills to the test. Where can you find Keith? You've got it! In his garage OR ....with his friends having a few laughs and lots of fun. After many years of driving, Keith accomplished one more of his dreams in the early fall of 2010 when he earned his licence to drive dragsters.With the help of owner, driver and unofficial crew chief of the 'Mopar Mafia' dragster, Scott Foster; Keith was given the opportunity to drive the dragster and after three successful passes earned his licence. under his belt Keith intends to continue driving both the dragster and his '69 Dodge Dart'. Fast forward to the summer of 2012 and dreams have become a reality for Keith thanks to owner/driver Bruce Gaier. Keith entered the 'Quick 32'and drove the 'Gaier' dragster through the famous archway of the Lucas Oil Raceway in Indianapolis, Indiana; the racetrack where his idle Don Garlits drove and today's Tony Schumacher drives. Keith's skill as a drag race driver came to the forefront when he qualified 8th in the Quick 32 at Indianapolis. He went on to the final in the dragster side losing to John Labbous Jr. by .004. 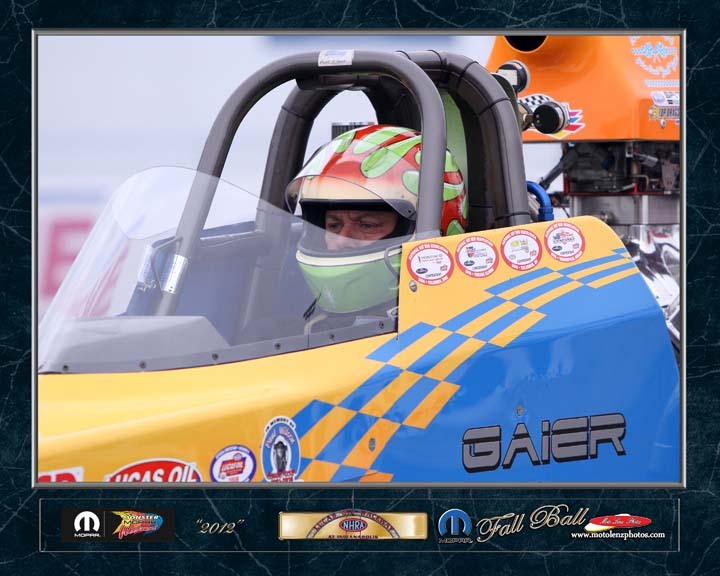 At Norwalk Keith managed to make some quick passes in the Gaier dragster. He went 4.58 at 151 mph in 1/8 mile and 7.22 at 183 mph in � mile, pushing the dragster to the fastest passes of the year. 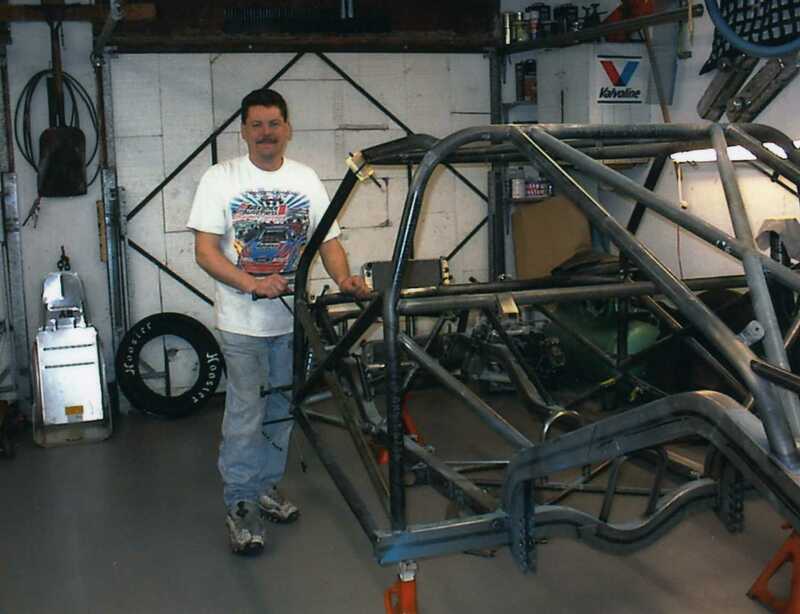 at Norwalk, Ohio, September 16, 2012.
inside the race car ~ 'Never Enough', September 2011.